New Rates!! - New Northwest Chess subscription rates are now in effect. (These rates include full OCF or WCF memberships as applicable to residents of Oregon and Washington.) Discounts are still available - Pay only $65 for three years (adult), $45 (junior) or $12 (additional family member w/o subscription). The rates are available on the PayPal subscription page and on the PDF (mail-in) subscription form. Washington residents: please add the applicable sales tax. Idaho residents: please see ICA website for information about ICA Premium Memberships which include a NWC subscription, or pay the same rates as Oregon and Washington as of January 1, 2014. Scholastic News! See Coquille chess players compete in two tournaments in The World (Dec. 16). Also Ponderosa (Elementary School) students learn elements of chess from Grandpa Jack in The Spokesman-Review (Dec. 28) from Spokane. New Master! Bryce Tiglon became the Northwest's newest master on Sunday, December 1. He scored 4/6 at the WA Class in Lynnwood and gained 29 points to boost his rating to 2228! He beat NM Josh Sinanan and drew with FMs Curt Collyer and Nick Raptis along the way. Congratulations, Bryce! December magazine! 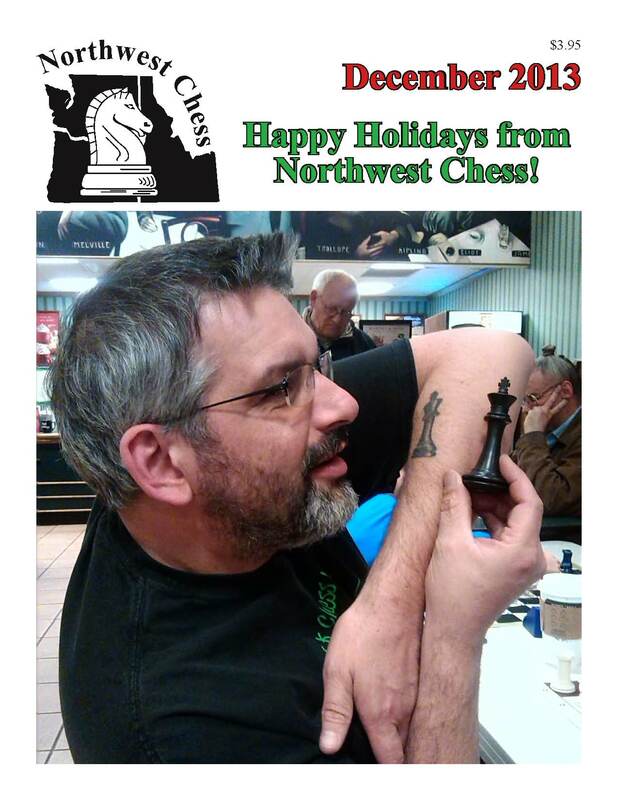 The December issue of Northwest Chess was mailed on 11/27. it's a 32-page issue with Oregon Chess News, Idaho Chess News, "Ontology Of Chess" by Jacob Stinar, Washington Chess News and the usual Northwest Chess Grand Prix Report by Murlin Varner. Cover: ICA Vice President Adam Porth showing his tattoo. Photo by Jeff Roland. GP Standings! Current Grand Prix standings are available in the December NWC magazine. The 2013 Grand Prix was named in honor of Elena Donaldson. Carlsen Wins World Championship! The FIDE World Championship Match, scheduled for Nov. 7-28 in Chennai, India, concluded on Nov. 22 after 10 of 12 games, with challenger Magnus Carlsen of Norway defeating defending champion Viswanathan Anand of India by a score of 6.5-3.5. Carlsen won games 5 and 6 on Nov. 15-16, and game 9 on Nov. 21, after Anand faltered trying to press a kingside attack. All other games ended in draws. You can find coverage on the official match website or on a number of other chess websites. For a local site with match commentary, see James Stripes' Chess Skills blog. See article about Carlsen on the Yahoo sports pages. See article on Alabama Public Radio website. World Senior! The Individual World Senior Chess Championship was also contested November 11-24 in Croatia. - See the official website, Jude Acers website and a website of photos. Scholastic Story! See "Chess for Success plays the long game with kids" on The Oregonian oregonlive.com website. Would you believe? ... a movie called Computer Chess! It's true, it's about one of the tournaments back in the 1980s to determine the best program, it played in Portland Nov. 8-14, and apparently it's "highly entertaining." See the review on oregonlive.com. Sluggers end season - Although the Seattle Sluggers ended a disappointing season with a loss to San Francisco, the Sluggers' Curt Collyer did win a game against nearly 2500-rated FM Yian Liou with a queen sacrifice and mating attack. You can't win 'em all - although the Sluggers didn't make the playoffs this year, they did win the league championship last year. The Sluggers played their matches at the Orlov Chess Academy in Greenlake. Address: 7212 Woodlawn Ave NE, Seattle, WA 98115. All games were played on chess.com, and could be watched for free. See U.S. Chess League website. November magazine mailed! The November issue of Northwest Chess was mailed on 10/30. 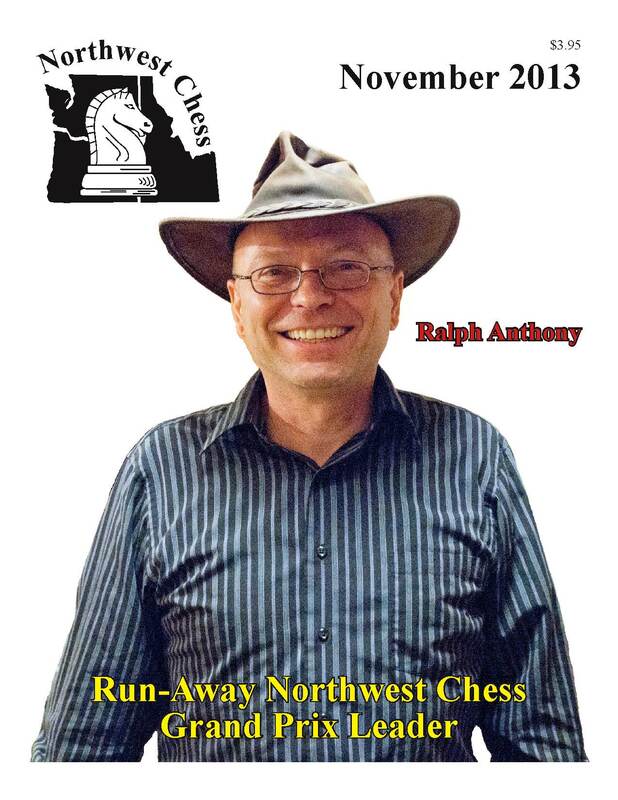 It's a 32-page issue with "Spotlight on Ralph Anthony, Northwest Chess Grand Prix Leader," Washington Chess News (including the Seattle Sluggers), Oregon Chess News, Idaho Chess News and the usual Northwest Chess Grand Prix Report by Murlin Varner. Cover: Ralph Anthony, NWC Grand Prix Leader, as taken at the 2013 Oregon Open. Photo by Jeff Roland. We understand that Ralph was a bit surprised by his appearance on the cover! Old Chess Movie! A 1920s era Soviet silent comedy film about chess, Chess Fever, is now available on Facebook. Click here. Two of the famous players featured in the movie are Capablanca (world champion at the time) and Marshall. New Exhibition in St. Louis! In case anyone is planning on visiting the World Chess Hall of Fame in St. Louis, there is a new exhibit titled Jacqueline Piatigorsky: Patron, Player, Pioneer. Piatigorsky was a chess legend who dedicated much of her time, talent and resources to promoting the game that she loved during the 1950s-80s. The new show at the WCHOF uses artifacts from her archive to tell the story of her fascinating life and fantastic achievements in the world of chess. The exhibit runs through April 18, 2014. If anyone from the Northwest does visit, please let us know your impressions. Match announced! The Washington Chess Federation is proud to host current Washington State Champion FM Ignacio Perez in a special match against rising star and current Washington State Blitz Champion NM Roland Feng. The two will face off Dec. 14-15 in a unique competition that will test their classical chess skills along with their abilities at both blitz and rapid play. Opening ceremonies and a simultaneous exhibition will take place Friday evening, Dec. 13 at the Seattle Chess Club. See flyer. There will also be a Northwest Chess fundraising tournament in conjunction with the match. New Acers article/film! A new article and short film about longtime New Orleans chess master Jude Acers, "The Man in the Red Beret," has been posted by http://classactionfilms.com/. October magazine mailed! The October issue of Northwest Chess was mailed on Thursday, 9/26. 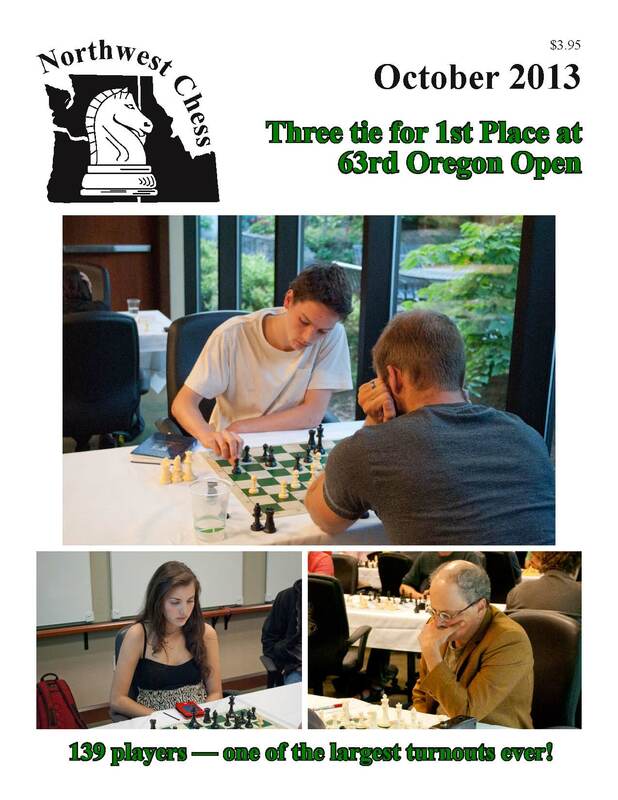 It's a 32-page issue with Oregon Chess News (including the Oregon Open), Idaho Chess News, Washington Chess News (including the Seattle Sluggers) and the usual Northwest Chess Grand Prix Report by Murlin Varner. Cover: Winners of the 2013 Oregon Open (Aaron Grabinsky, Alexandra Botez, and Richard Gutman) in three photos by Jeff Roland. WCF mailing address change! Effectively immediately, please address WCF mail to the Orlov Chess Academy, 2501 152nd Ave NE Suite M16, Redmond, WA 98052. Please discontinue use of the old Seattle PO Box address. This does not affect mail sent to the Northwest Chess Business Manager. New Masters! Washington’s newest national chess masters are Daniel He of Redmond, who scored 4/4 (of games played) in the Oregon Open last weekend, reaching a USCF 2202 rating, and Nathan Lee of Issaquah, who gained 21 rating points in the Cal Chess Labor Day Championship to bring his USCF rating to 2201. Congratulations to these two players on this important accomplishment. Interesting articles! See "Chess program helps local seniors stay sharp" from My Edmonds News. And, if you can withstand the politics, see "Elite chess and the aging process: a conversation with Genna Sosonko" and other chess articles on The Voice of Russia (radio) American edition website. September magazine mailed! The September issue of Northwest Chess has been mailed. 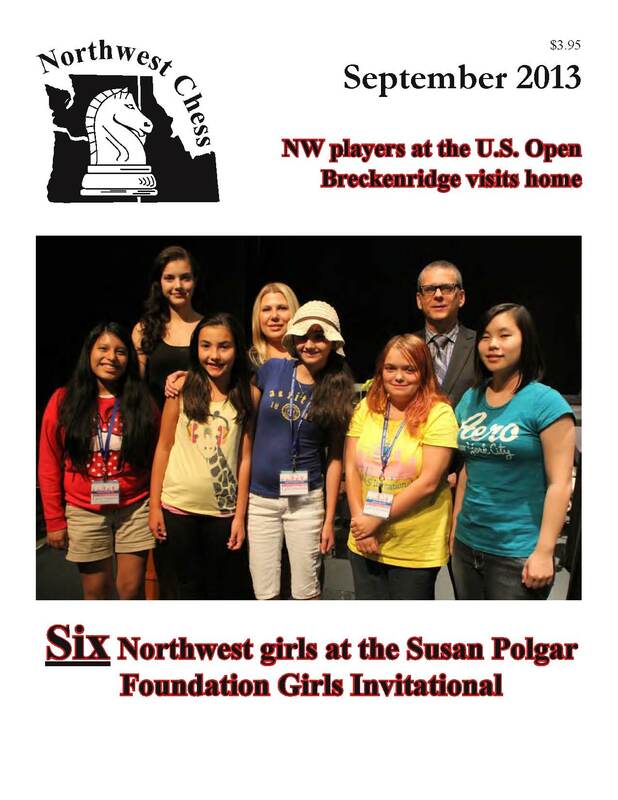 It's a 32-page issue, with "Six Northwest Girls at the Susan Polgar Foundation Girls Invitational," "A Nice Time in the Middle of the Country (U.S. Open Report)" by Murlin Varner, Some Games from the U.S. Open, Idaho Chess News, Oregon Chess News, Washington Chess News and a Northwest Chess Grand Prix Report. Cover: Six Northwest girls plus Susan Polgar and Jeff Roland at the closing ceremonies of the 10th Annual Susan Polgar Foundation Girls Invitational on July 25, 2013. Photo courtesy of Susan Polgar Foundation and Paul Truong. Columbia Cup postponed! The WCF-hosted Columbia Cup in Richland was postponed from July 27-28 to November 9-10 (Veteran's Day weekend), and has been renamed the Tri-Cities Open. The WCF revised the format of the tournament to better accommodate players from the Richland area and build up chess in the region. See the new TA-style ad. August magazine mailed! The August issue of Northwest Chess was mailed on July 24. 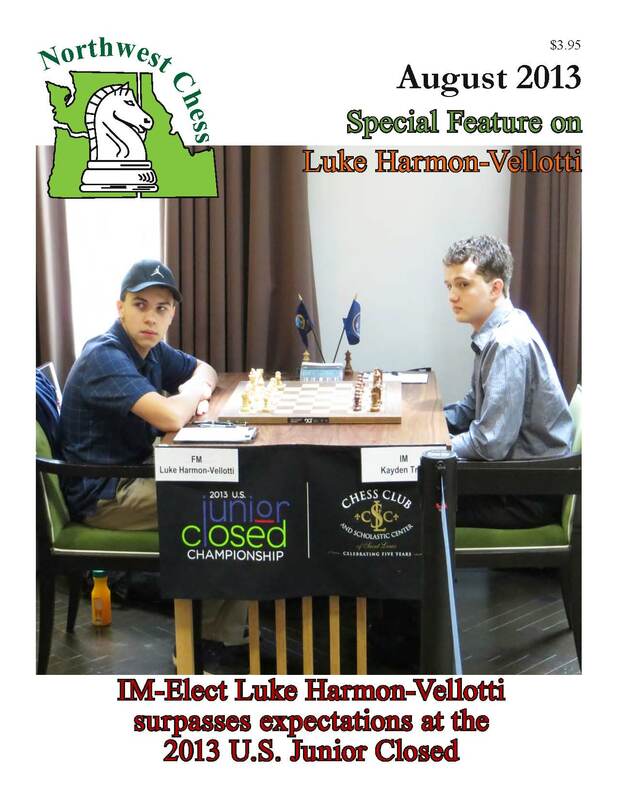 It's a 32-page issue with "Just a Matter of Time for Luke Harmon-Vellotti" by Frank Niro, Idaho Chess News, Oregon Chess News, Washington Chess News, and the usual Northwest Chess Grand Prix Report by Murlin Varner. Cover: Luke Harmon-Vellotti playing Kayden Troff at the 2013 U.S. Junior Closed by Tony Rich and courtesy of the St. Louis Chess Club. Seminar Tour! 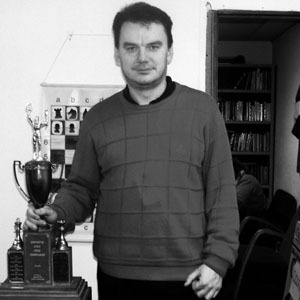 Former U.S. Women's Chess Champion, Ph.D. Alexey Root, will be touring Washington and part of Oregon through August 16 giving seminars for parents and teachers who want to establish chess in their classroom, people who help with after school programs, and others who wish to teach chess. "Thinking with Chess: Teaching Children Ages 5-14" is a free seminar. Search for Alexey or chess promoter Barbara Fortune on Facebook for more information. See email (as PDF) with Alexey's schedule. Also see Alexey's page on the UT Dallas website. Also search for Alexey's books on amazon.com or your favorite book seller. Roland featured in July Chess Life! The July 2013 issue of the USCF's monthly Chess Life magazine features Northwest Chess editor and ICA President Jeff Roland on page 9 under "Faces Across the Board." Also the cover story, a memorial to GM Robert Byrne (1928-2013), was written by Frank Niro, who was the interim Northwest Chess editor for part of 2012. July magazine mailed! The July issue of Northwest Chess was mailed on June 26. It's a 32-page issue with Washington Chess News (including the Washington Open), Oregon Chess News, Idaho Chess News, "An Afternoon Chat with Yasser" by Frank Niro and	a Northwest Grand Prix Report by Murlin Varner. 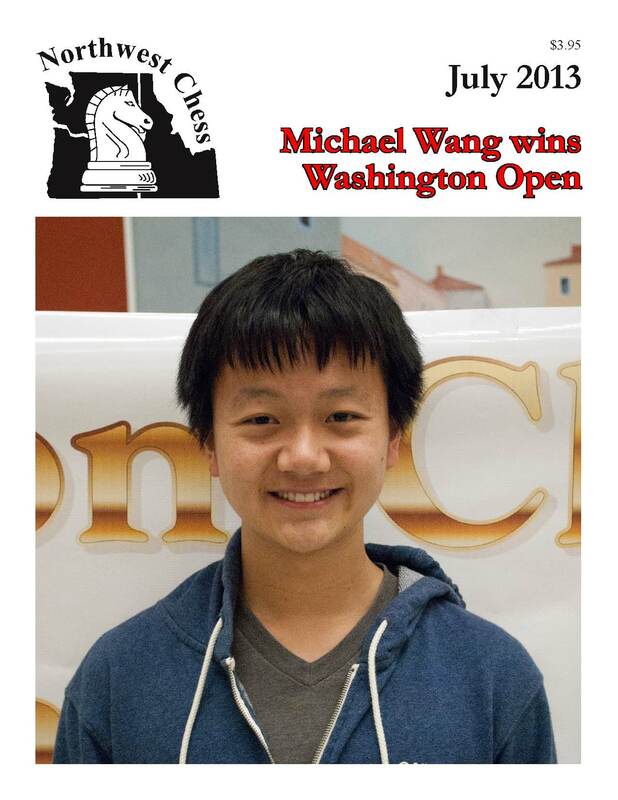 Cover: Michael Wang wins Washington Open. Photo credit: Jeff Roland. Paul Morphy update! USCF erroneously claimed that American chess icon Paul Morphy was born in New Orleans on June 22, 1863, 150 years ago. (It was in New Orleans but in 1837.) In just a few short years, Morphy won the first American Chess Congress and then went to Europe winning matches against all the great players of his era. Oh well ... at least a few people received a special membership offer as a result of the USCF designation of Paul Morphy Day! Vellotti in U.S. Junior Closed! Luke Harmon-Vellotti of Idaho was invited to play in the 2013 United States Junior Closed, the most prestigious event for youth players in the country. This event was invitation-only for the top 10 players in the country under the age of 21, and was held at the world-famous Chess Club and Scholastic Center of St. Louis as a 10-day round robin event from June 13 to 23. The same club hosted the U.S. Chess Championship, won on May 13 by GM Gata Kamsky (his fourth title) in an Armageddon game against GM Alejandro Ramirez, who was seeking his first title. | Also see Field Set for 2013 U.S. Junior Closed Championship on the USCF website. | On his Facebook page, Vellotti also reports defeating GM Hikaru Nakamura in 5-minute chess on ICC on June 4! | See article about Luke from the Idaho Statesman (June 8). | See Idaho chess prodigy is only 14 on KIVI TV. | See 14-year-old Boise chess phenom headed for UCLA on KBOI2.com (July 1-2). Szabo in online championship! See 11-year-old chess champion to compete in national competition from the Queen Anne News and Magnolia News, about Magnolia resident Marcell Szabo, who competed against some of the highest-rated chess champions his age in the second-annual Online National Chess Championship, June 14-17, sponsored by chesskid.com. International Match Ended! Rusty Miller reports than a 6-board email match between Vancouver, Washington and Dubrovnik, Croatia, which began on March 10, recently ended (by about June 12) with Dubrovnik winning. See Rusty's blog post. Chess Journalists appoint new President and Vice President! (May 30) The Board of Directors of Chess Journalists of America (CJA) has announced the election of Frank Niro and Jeffrey Roland as interim president and vice president, respectively, of CJA, until the next CJA regular election in August. Mr. Niro replaces Al Lawrence who recently stepped down in order to undergo surgery. Mr. Roland, currently President of Idaho Chess Association and editor of Northwest Chess, fills an existing vacancy. For further information, please visit the Chess Journalists of America website at: http://chessjournalism.org/. New Master! Michael Wang is now a USCF National Master. He won Washington Open (May 25-27) and will be seeded into the state championship next year. See the WA Open blog post. Congratulations! New WCF Board! 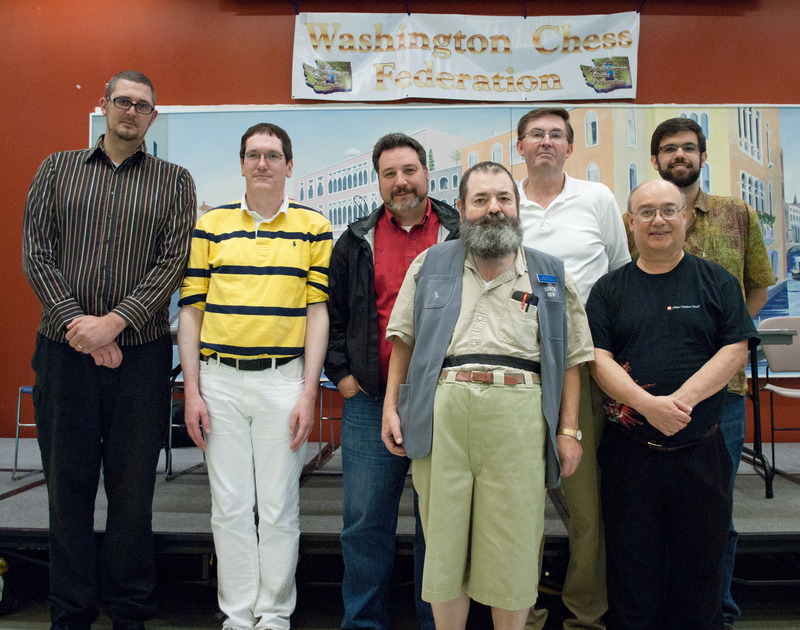 This is the new Washington Chess Federation Board, with some of the officers on staggered two-year terms elected at the Washington Open. Left to right: Eelco van Ruth (Tournament Coordinator), Robert Allen (Treasurer), Marty Campbell (Member At Large), Gary Dorfner (Secretary), David Hendricks (Scholastic Coordinator), Duane Polich (Vice President), Joshua Sinanan (President). Photo credit: Jeff Roland. Fundraiser! The Seattle Chess Club is conducting its spring fundraiser drive to help support its various activities including hosting events such as the state championship and grandmaster lectures. Checks can be made payable to the SCC and sent to the Seattle Chess Club, 2150 N 107th St, Seattle WA 98133. June magazine mailed! The June issue of Northwest Chess was mailed on May 21. Copies should be available at the WA Open. It's a 32-page issue with Oregon Chess News, Idaho Chess News, Washington Chess News and a Northwest Grand Prix Report by Murlin Varner. 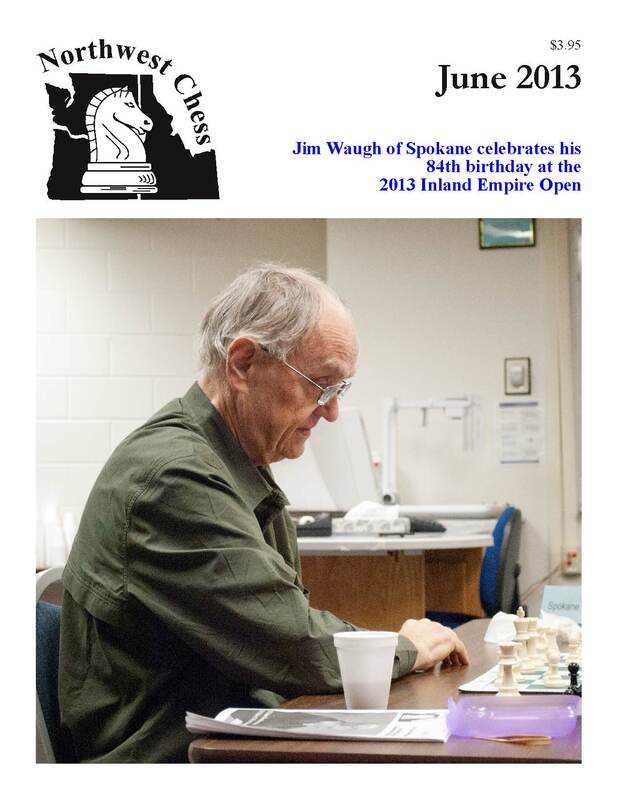 Cover: Jim Waugh of Spokane celebrates his 84th birthday at the 2013 Inland Empire Open. Photo credit: Jeff Roland. Match of the Editors! Northwest Chess editor Jeff Roland is playing a USCF-rated chess match against previous editor Frank Niro. The match started on April 4, and resumed on May 23. Details are available on the ICA website, and see the June teaser for the first four games already completed. Acers 20 years ago! See Chess legend Jude Acers, video story from a New Orleans TV station in 1993. On his own website, Acers also writes about the recent death of New York Times chess commentator, GM Robert Byrne, at the age of 86. Kasparov at 50! See Kasparov at 50 by Mig Greengard (posted April 14) on The Week in Chess. Scholastic Chess Article! Sherwood's Middleton Elementary School hosts largest school-wide chess tournament in Oregon from The Oregonian (May 9 about a May 3 event). May magazine update! The May issue of Northwest Chess was uploaded to the printer on April 23, and mailed on April 30 after a short delay. 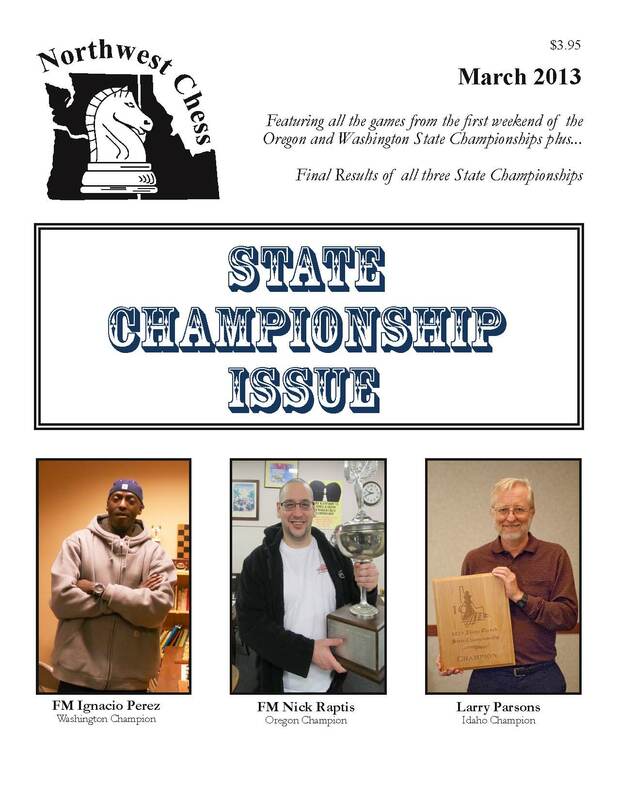 It's a 32-page issue with State Championship Games (Part III) Washington Games Conclusion, Oregon Chess News by Frank Niro, Washington Chess News compiled by Russell “Rusty” Miller, Idaho Chess News, and the usual Northwest Grand Prix Report by Murlin Varner. 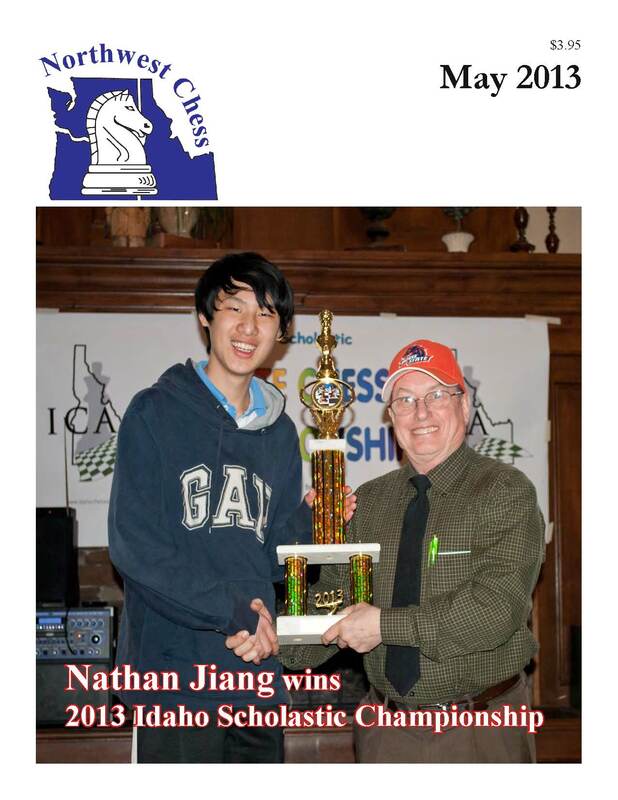 Cover: Nathan Jiang wins the Idaho Scholastic Championship. Also pictured is retiring ICA President, Jay Simonson. Photo credit: Jeff Roland. New Everett Club! A new chess club in Everett, the Chess Geeks, is meeting at the Everett Mall beginning on Saturday May 18. See the club's information page on this website. Interview! with Magnus Carlsen by Charlie Rose on PBS (posted April 24, 2013). Carlsen is currently the highest ranked chess player in the world. Interesting Article! "Chess Should Be Required in U.S. Schools" by Alex Berezow on "Newton Blog" on RealClearScience.com. New Master! Megan Lee has been awarded the Woman FIDE Master (WFM) title, reaching a FIDE rating of 2114. She is also the second highest FIDE-rated woman in the U.S. under the age of 18. Board Meeting! 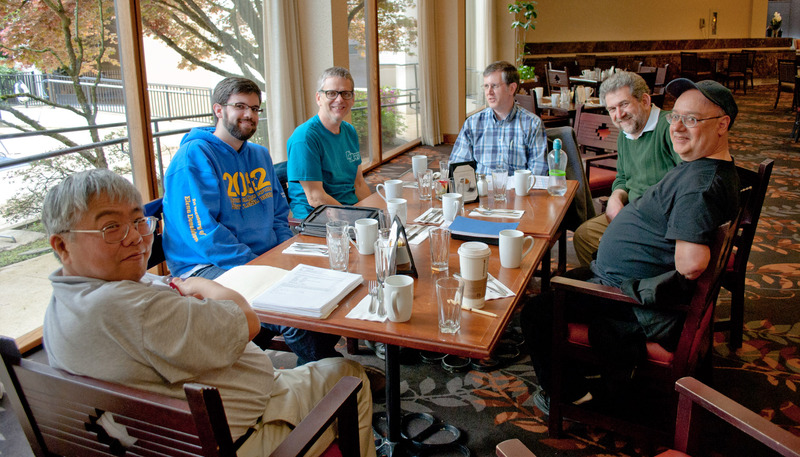 The Northwest Chess board met on Sunday April 14, 2013 at the Harmon Memorial tournament in Portland. Left to right: David Yoshinaga, Josh Sinanan, Jeff Roland, Eric Holcomb, Grisha Alpernas and Duane Polich. Photo credit: Jeff Roland's camera, taken by Frank Niro. Yasser in St. Louis! On Tuesday, April 9, the World Chess Hall of Fame held the first installment of its free lecture series, featuring Yasser Seirawan, Rotating Grandmaster in Residence at the Chess Club and Scholastic Center of Saint Louis. In his first lecture, GM Seirawan discussed chess history, from its roots in India almost 1500 years ago to the advent of modern technology and its impact on today's players. Info. : Lauren Stewart, lauren.stewart@worldchesshof.org, (314) 367-9243 ext 106. Interesting Article! See "How the Chess Set Got Its Look and Feel" from Smithsonian Magazine blog. April magazine mailed! 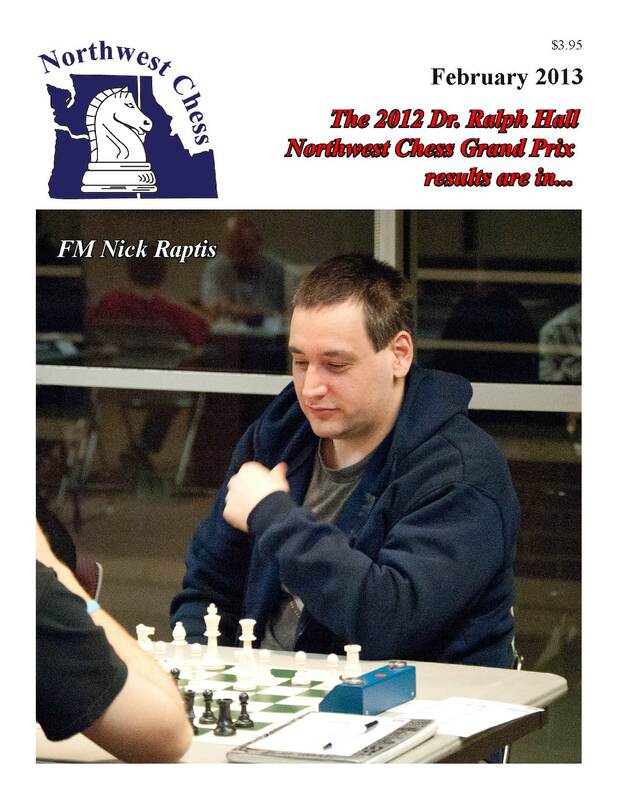 The April issue of Northwest Chess was mailed on Wednesday, March 20. It's another 32-page issue with Dave Collyer Memorial Tournament Report by Kevin Korsmo, "Luck in Chess" by IM John Donaldson, State Championship Games (Part II) Oregon plus Idaho, Idaho Chess News, Washington Chess News, Scholastics, Oregon Chess News and the usual Northwest Grand Prix Report by Murlin Varner. 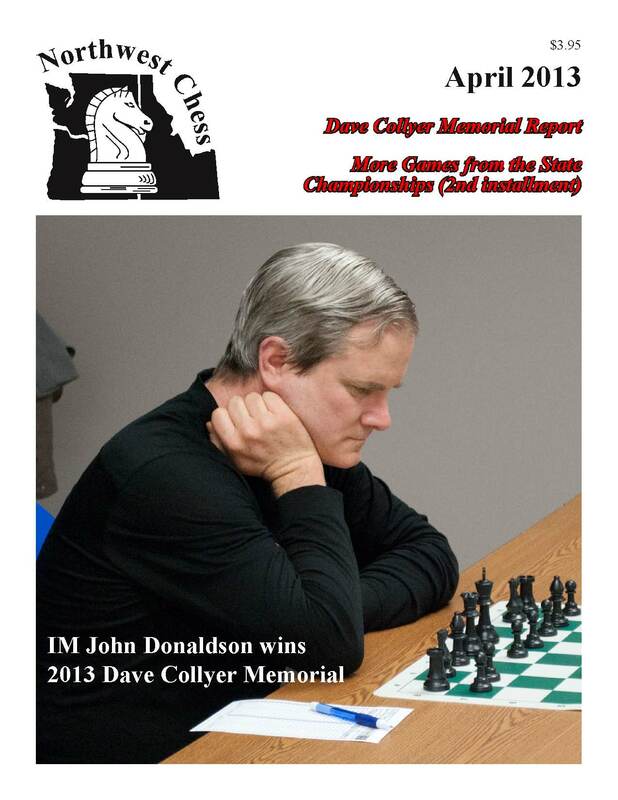 Cover: IM John Donaldson at the 2013 Dave Collyer Memorial by Jeff Roland. More Scholastic Articles! Lincoln High chess team wins state, looks ahead to winning future from The Oregonian (Mar 29 about Mar 8 event) | LMS (La Grande, OR Middle School) chess club shows promise from The Observer (posted March 13). | Coquille team wins at state chess tournament from The World (posted March 12). | Ellensburg students move straight to chess on lunch breaks from the Yakima Herald Republic online (posted March 6). | Bits 'n' Pieces: Teen chess expert aims to master from The Columbian (Jan 25 edition). March magazine mailed! The March issue of Northwest Chess was mailed on 2/28. It's a 32-page issue with Washington State Championship Results, Oregon State Championship Results, Idaho State Championship Results, State Championship Games (the first weekend, February 9-10), John Donaldson Book Review, Washington Chess News, Oregon Chess News, Idaho Chess News and the usual Northwest Grand Prix Report by Murlin Varner. New Master! Igor Ummel, a college student at the University of Washington, became the Northwest's newest master on Monday, Feb. 18. He scored 4.5/9 at the 2013 WA State Championship in Seattle and gained 19 points to boost his rating to 2206! He beat Nathan Lee (2155), FM Curt Collyer (2311), and drew with NM Tian Sang (2312) along the way. Congratulations Igor! USCF crosstable link. Now Online! According to USCF, the award-winning documentary Brooklyn Castle is now available on iTunes and on Video on Demand on most cable systems, Hulu, Amazon and other direct movie channels. Brooklyn Castle is a documentary about I.S. 318, an inner-city public school that's home to the most winning junior high school chess team in the country. Website:	http://www.brooklyncastle.com. Also Online! Rusty Miller reports that "King Arthur" is an article about chess grandmaster Arthur Dake (1910-2000) of Portland by Casey Bush in the Jan./Feb. 2013 issue of 1859 OREGON'S MAGAZINE. The article is now available on the magazine's website - see our own "People Articles" page for more on Dake, including a link to the article, which is well-worth reading. Simul! Costin Cozianu (2508 USCF), the highest rated player in the Washington state championship and former state champion, graciously agreed to give a simultaneous exhibition at the Seattle Chess Club at 3 p.m. on Saturday, Feb. 16 between rounds 5 and 6 of the state championship. The event was free and open to the public, with a maximum of 20 players. IM John Donaldson also gave a simul and talk on Friday evening, Feb. 22 in Spokane before the Collyer Memorial tournament. Polgar Article! See "The ‘Queen’ [Susan Polgar] Wants to Turn Chess Into a Spectator Sport," posted Feb. 12 on wired.com. Could chess become as popular as golf or poker? Scholastic Articles! See "Success through chess - Program helps students develop critical and creative thinking skills while having fun" in the Jan. 28 Camas-Washougal Post-Record, and "Junior chess tournament draws 97 players" in the Columbia Basin Herald about a recent tournament in Ephrata, WA. February magazine mailed! The February issue of Northwest Chess was mailed on 1/23. It's a 32-page issue with Dr. Ralph Hall Northwest Grand Prix (Final 2012 Report) by Murlin Varner, Oregon Chess News, PNW Players Results at the 22nd North American Open (Las Vegas), Washington Chess News, Scholastics, Idaho Chess News, The Modern von Bardeleben by Matt Wilson. Grand Prix Results! Complete results of the 2012 Dr. Ralph L. Hall Memorial Northwest Chess Grand Prix are now available (see the NWC Grand Prix page) and a summary appears in the February magazine. Checks were mailed to the winners at the end of January. Congratulations! January magazine mailed! The January issue of Northwest Chess was mailed on Friday, 12/21. it's a 48-page special memorial issue with "Elena Donaldson Akhmylovskaia (1957-2012) by Frank Niro," "World Youth Championship (NW Players) by the players/families," "Seattle Sluggers U.S. Chess League Champions," Idaho Chess News, Washington Chess News, Oregon Chess News, and a Northwest Grand Prix report by Murlin Varner. Cover: Georgi Orlov and Elena Donaldson Akhmylovskaia in August 2008. Family photo courtesy of Georgi Orlov.